The photograph shows a specimen of Thalassiosira yabei (Kanaya) Akiba & Yanagisawa from the diatomaceous mudstone of the Miocene Nakayama Formation in Sado Island, Niigata Prefecture, central Japan. 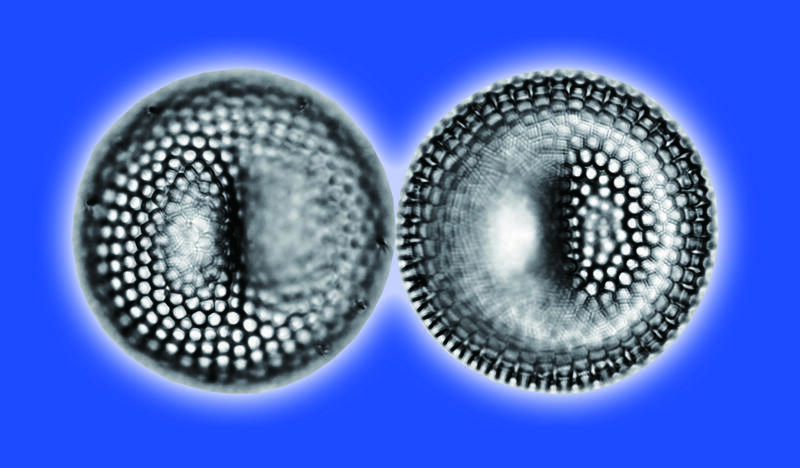 This diatom species was described in 1959 as Coscinodiscus yabei by Dr. Tato Kanaya, one of the outstanding pioneers of marine diatom biostratigraphic study. The species is characterized by its tangentially undulated valve face, with one side convex and the other side concave. It was transferred to the genus Thalassiosira in 1986 and have played an important role in diatom biostratigraphy as the nominate species for the late Miocene Thalassiosira yabei Zone (NPD5C). Revised lithostratigraphy of the Neogene sedimentary sequence in the southern part of the Osado Mountain area, Sado Island, Niigata Prefecture, Japan. A revised lithostratigraphy has been proposed for the Neogene sedimentary sequence distributed in the southern part of the Osado Mountains area, Sado Island. The Neogene sediments of this area unconformably overlie the lower Miocene volcanic rocks, and are divided into seven formations in ascending order: the Orito, Hanyugawa, Nakayama, Nozaka, Kawachi, Kaidate and Shichiba formations. The Orito Formation is redefined in this report, consisting of fluvial sediments in its lower part and muddy fine-grained sandstone of estuary environment in its upper part. The newly proposed Hanyugawa Formation is conformably overlies the Orito Formation with a basal transgressive conglomerate bed and consists of marine calcareous sandstone, gray marine mudstone and glauconite sandstone. The redefined Nakayama Formation is composed of lower hard siliceous mudstone and upper diatomaceous mudstone containing abundant well-preserved marine diatom fossils. The Nozaka Formation is proposed for massive mudstone which overlies the Nakayama Formation with a glauconite bed. Marine diatom biostratigraphy has been established for the Neogene sedimentary sequence distributed in the southern Osado Mountains area, Sado Island, Niigata Prefecture, Japan. The Neogene and Pleistocene sediments in this area are composed of the Orito, Hanyugawa, Nakayama, Nozaka, Kawachi, Kaidate and Shichiba formations in ascending order. This study examined diatoms in the Nakayama and Nozaka formations. The Nakayama Formation is composed of lower hard siliceous mudstone and upper diatomaceous mudstone, and correlated to the diatom zones NPD5B to NPD6A, ranging in age from 12.3 to 6.5 Ma. The Nozaka Formation overlies the Nakayama Formation with a glauconite bed and consists of marine massive mudstone. This formation is assigned to the subzones NPD7Ba and 7Bb, and its depositional age is estimated from 6.5 to 4.2 Ma. The age of the Orito Formation is determined to be latest Early Miocene between 17.0 and 16.7 Ma on the basis of the occurrence of the widespread Arcid-Potamid-type molluscan assemblage. The depositional age of the Hanyugawa Formation is dated by the ages of underlying Orito and overlying Nakayama formations to be early Middle Miocene ranging from 16.7 to 12.3 Ma, suggesting a long slow depositional time interval of over 4 million years.